On May 24, three days after British General Thomas Gage sent four sloops to tiny Grape Island near the town of Weymouth to pick up some recently harvested hay from the loyalist Elijah Leavitt, the Massachusetts Committee of Safety ordered all livestock and hay removed from nearby Noddles and Hog Island. The two contiguous islands lay east of Charlestown and formed a peninsula that reached from the town of Chelsea toward Boston to the southeast with the town of Winnisimmet on the opposite shore directly north. Those who sold their goods to the British faced the wrath of rebels, just as Elijah Leavitt had, and those who sold to the rebels faced the wrath of the British. One resident of Hog Island had been warned that if he sold anything to the British, the rebels would take all the cattle from the island and … handle him very roughly. On the evening of May 26, American General Artemas Ward sent Colonel John Nixon of Sudbury and Colonel John Stark and his New Hampshire regiment to implement the committee’s directive. On the morning of May 27, approximately 500 rebels waded across the Chelsea-Hog Island channel, which at low tide became an easily fordable, knee-high creek with wide mudflat banks. A detachment of 30 men continued on to Noddle’s Island to corral livestock and burn hay. About 40 British marines occupied buildings on the island to warehouse stores and stockpile hay there for its horses in Boston. As the rebels rounded up sheep and cattle, British Admiral Samuel Graves was celebrating his promotion to vice admiral of the white squadron. His nephew, Lieutenant Thomas Graves, commander of the schooner Diana, sailed into Boston Harbor and joined the festivities. Amid the pomp of his promotion ceremony, Admiral Graves was aware of an urgent message from General Gage dated two days before, reporting that “the Rebels intend this Night to destroy, and carry off all the Stock & on Noddles Island for no reason but because the owners having sold them for the Kings use.” This piece of intelligence may have come from Dr. Benjamin Church, but Church wasn’t Gage’s only spy and at that time, Church was on the road to Philadelphia to deliver missives from the Massachusetts Provincial Congress to the Continental Congress. Around 2:00 p.m., the admiral was notified that smoke could be seen rising from Noddle’s Island. Stark and Nixon and their men had set fire to a barn full of hay and had killed some of the livestock drawing the attention of the marines stationed on the island. Admiral Graves responded by ordering his nephew to sail Diana up the narrow waterway that lay between the islands and the mainland while 170 marines were sent to pursue the rebels on foot on Noddle’s Island. Armed with four six-pounders and a dozen smaller swivel guns, Diana fired on the rebels on Noddle’s Island while the larger force of marines splashed ashore from longboats. The Noddle’s Island rebel forces slaughtered some of the livestock they had corralled and retreated across Crooked Creek. Half the rebels continued on with the livestock while the other half jumped into a ditch and commenced a rear guard action to keep the schooner and the marines at bay. By 5:00 p.m. Diana was in the shallows between Hog Island and the mainland. Diana exchanged heavy fire with the rebels on Hog Island and the rebels on the Chelsea mainland. Under heavy rebel fire and with an outgoing tide threatening to ground his schooner, the commanding officer, Lieutenant Graves, sought the aid of a dozen longboats to tow him back down the creek in the dying breeze. In hopes of ambushing Diana before she reached the safety of the harbor, the rebels rushed down the north shore of Chelsea Creek toward Winnisimmet. By 9:00 p.m., the sun was setting. Colonel Israel Putnam and Dr. Joseph Warren arrived at Newgate Landing with two field pieces and more men. Putnam directed his cannon fire at Diana that was now slowly drifting south along the shore. The Royal Navy marines had transported several cannons to a hill on Noddle’s Island. Out of the darkness, cannonballs whistled down at the rebels as they waded into the creek and fired at the longboats towing Diana past the Winnisimmet shore. The rebel cannons returned fire with such effectiveness that the British longboat crews were forced to abandon Diana. The schooner soon drifted toward shore and grounded on the wooden rails extending from the ferry dock. Lieutenant Graves and his men attempted to use their anchor to drag the schooner to deeper water, but as the tide ebbed, the schooner began to roll onto her side. They had no choice but to abandon her for the sloop Britannia anchored in deeper waters. Later that night, the rebels plundered Diana of her guns, rigging, and equipment, and then set her on fire. Around 3:00 a.m., the fire reached the vessel’s powder magazine and the schooner exploded. That night, Israel Putnam and Joseph Warren returned to Cambridge to report to General Ward. “I wish we could have something of this kind to do every day,” Putnam crowed. General Ward was concerned that the engagement might provoke the British to launch a sortie from Boston. The skirmish at Chelsea Creek was a humiliating defeat for Admiral Graves and his nephew. It was a clear rebel victory, but it had also consumed a large amount of rebel gunpowder. Joseph Warren had been in favor of an attack on Boston. He now had a more realistic view of his army’s preparedness. Philbrick, Nathaniel. Bunker Hill A City, A Siege, A Revolution New York: Penguin Books, 2013. Print. Borneman, Walter R. American Spring: Lexington, Concord, and the Road to Revolution New York: Little, Brown and Company, 2014. Print. #10. Family physician of John Adams. He was an active organizer of the Boston Tea Party and participated in the Continental Congress. #9. Printed a radical rebel newspaper in Boston, the Massachusetts Spy and founded The American Antiquarian Society. #8. Edes published the antagonist Boston Gazette, a newspaper which financed the Boston Tea Party and printed anti-British propaganda. #7. Became a spy for General Thomas Gage, first Surgeon General of the Continental Army, character in the video game Assassin’s Creed III. #6. Arnold, along with Ethan Allen and his boys, won control of Ft. Ticonderoga for its aging artillery. Gave $500 to Joseph Warren’s orphans. #5. April 18, 1775, Joseph Warren dispatched Dawes to Lexington to warn John Hancock, Samuel Adams, & the militias, of British movement. #4. April 18, 1775, Joseph Warren dispatched Revere to Lexington to warn John Hancock, Samuel Adams, & the militias, of British movement. #3. Hancock used his wealth to support the colonial cause. Samuel Adams, Joseph Warren, and Hancock were the ultimate triumvirate for liberty. #2. “Father of the American Revolution” because of his early stand against the tyranny of Great Britain. Failed in business and pecuniary matters. #1. Handsome idolized leader of the rebellion April – June 1775, Major General, killed at Bunker Hill at age 34, America’s first martyr. The violences committed by those who have take up arms in Massachusetts Bay have appeared to me as the acts of a rude Rabble without plan, without concert, & without conduct, and therefore I think that smaller Force now, if put to the Test, would be able to encounter them with greater probability of Success…..
….In this view of the situation of the King’s affairs, it is the opinion of the King’s servants, in which his Majesty concurs, that the essential step to be taken toward reestablishing government would be to arrest and imprison the principle actors and abettors in the Provincial Congress (whose proceedings appear in every light to be acts of treason…. By the time Lord Dartmouth’s lengthy letter of advice reached Thomas Gage, tempers among the British ministry, the loyalists, and the patriots in Massachusetts had simmered down. In fact at this point, there was growing discord among the patriots’ own ranks, rooted in a misguided optimism that once King George III saw for himself that his ministers had misled him, the king would withdrawal his troops and the demand for unfair taxes would withdraw with them, leaving New England free. That optimism was founded in the colonists’ previous experiences with protests and the king’s withdrawal of the transgressions. If Gage had chosen to do nothing in response to Dartmouth’s letter that spring, the patriots may have had a difficult time maintaining a united front. Ironically, Dartmouth’s letter, based on information and instructions months old, arrived around the same time Gage was receiving valuable information from his British spies. Those things came together to lead Gage to make a series of decisions that would change the course of history. Just as ironically, one of Thomas Gage’s spies was a trusted colleague among the members of the Sons of Liberty and the Provincial Congress: Dr. Benjamin Church. When it came to rebel secrets and plotting; only Samuel Adams, John Hancock, and Joseph Warren were more involved than Benjamin Church. But Benjamin had an expensive mistress, and spying brought the ready cash he needed to please her. He had no qualms about betraying his fellow patriots in exchange for the means to pay for the treasures that lay between the legs of his mistress, Phoebe Yates. Church, among other spies, assured Gage there was a stockpile of provincial armaments located in Concord. Instead of taking Dartmouth’s advice to arrest the leaders of the Provincial Congress, Thomas Gage focused on securing and destroying the rebel military stores in Concord. 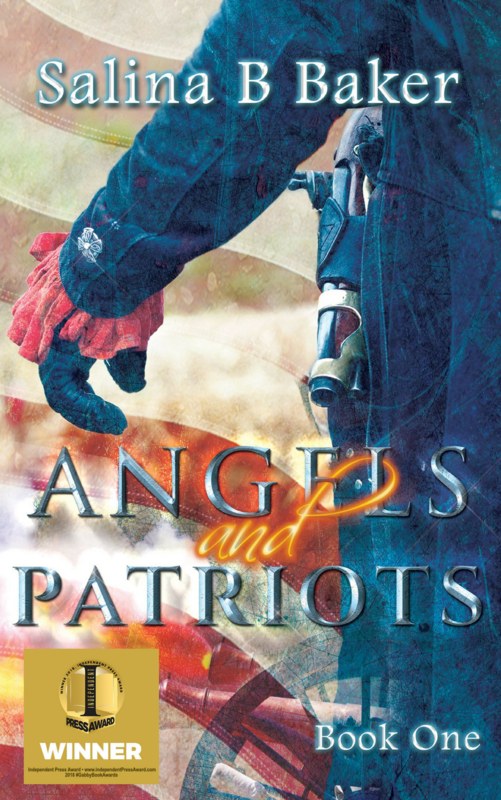 Angels & Patriots is the violent struggle for freedom, played out on the battlefield and the firmament as the angels fend off the demons in a quest to serve both humans and God. The lost souls of Eastport, Maine struggle for Providence and tolerance. Can a stranger deliver salvation? Salina B Baker Blog at WordPress.com.